The Territory of Colorado was an admitted to the Union as the State of Colorado. The territory was organized in the wake of the Union control over a mineral-rich area of the Rocky Mountains. Statehood was regarded as fairly imminent, but territorial ambitions for statehood were thwarted at the end of 1865 by a veto by President Andrew Johnson. Statehood for the territory was a recurring issue during the Ulysses Grant administration, with Grant advocating statehood against a less willing Congress during Reconstruction. The Colorado Territory ceased to exist when the State of Colorado was admitted to the Union in 1876. The territory was organized out of lands in the Rockies on both sides of the continental divide and incorporating the area of the Pikes Peak gold rush that had begun two years previously. East of the divide, the new territory included the western portion of the Kansas Territory, as well as some of the southwestern Nebraska Territory, and a small parcel of the northeastern New Mexico Territory. On the western side of the divide, the territory included much of the eastern Utah Territory, all of which was strongly controlled by the Ute and Shoshoni. The Eastern Plains were held much more loosely by the intermixed Cheyenne and Arapaho, as well as by the Pawnee, Comanche and Kiowa. In 1861, ten days before the establishment of the territory, the Arapaho and Cheyenne agreed with the U.S. to give up most their areas of the plains to white settlement but were allowed to live in their larger traditional areas, so long as they could tolerate homesteaders near their camps. By the end of the American Civil War in 1865, the Native American presence had been largely eliminated from the High Plains. The land which ultimately became the Colorado Territory had first come under the jurisdiction of the United States in three stages: the 1803 Louisiana Purchase as adjusted by the 1819 Adams-Onis Treaty, the 1845 Annexation of Texas, and the 1848 Mexican Cession. The land claims of Texas were, at first, controversial. The border between the USA and Mexico was redefined by the Treaty of Guadalupe Hidalgo at the end of the Mexican-American War in 1848, and the final boundaries of the state of Texas were established by the Congressional Compromise of 1850. Originally, the lands that comprised the Colorado Territory were inhabited primarily by the Ute from Western Colorado out onto the eastern high plains, and Anasazi in southwestern, southern, and part of southeastern Colorado. The Comanche and Jicarilla Apache also formally ruled over the southeastern portions of the state. Arapaho and Cheyenne also hunted, warred, and sometimes lived in the far eastern and northeastern portion of the state as well. The earliest explorers of European extraction to visit the area were Spanish explorers such as Coronado, although the Coronado expedition of 1540–42 only skirted the future border of the Colorado Territory to the south and southeast. In 1776, Francisco Atanasio Domínguez and Silvestre Vélez de Escalante explored southern Colorado in the Dominguez-Escalante Expedition. Other notable explorations included the Pike expedition of 1806–07 by Zebulon Pike, the journey along the north bank of the Platte River in 1820 by Stephen H. Long to what came to be called Longs Peak, the John C. Frémont expedition in 1845–46, and the Powell Geographic Expedition of 1869 by John Wesley Powell. In 1779, Governor de Anza of New Mexico fought and defeated the Comanches under Cuerno Verde in southwestern Colorado. In 1786, de Anza made peace with the Comanches, creating an alliance against the Apaches. A group of Cherokee crossed the South Platte and Cache la Poudre River valleys on their way to California in 1848 during the California Gold Rush. They reported finding trace amounts of gold in the South Platte and its tributaries as they passed along the mountains. In the south, in the San Luis Valley, early Mexican families established themselves in large land grants (later contested by the U.S.) from the Mexican government. In the early 19th century, the upper South Platte River valley had been infiltrated by fur traders, but had not been the site of permanent settlement. The first movement of permanent U.S. settlers in the area began with the Kansas-Nebraska Act of 1854, which allowed private land claims to be filed. Among the first settlers to establish claims were former fur traders who returned to the lands they once trapped, including Antoine Janis and other trappers from Fort Laramie, who established a town near Laporte along the Cache la Poudre in 1858. In 1858, Bent's Fort along the Arkansas River, Russell told William Larimer, Jr., a Kansas land speculator, about the placer gold they had found. Larimer, realizing the opportunity to capitalize on it, hurried to Auraria. In November 1858, he laid claim to an area across Cherry Creek from Auraria and named it "Denver City" in honor of James W. Denver, the current governor of the Kansas Territory. Larimer did not intend to mine gold himself; he wanted to promote the new town and sell real estate to eager miners. Larimer's plan to promote his new town worked almost immediately, and by the following spring the western Kansas Territory along the South Platte was swarming with miners digging in river bottoms in what became known as the Colorado Gold Rush. Early arrivals moved upstream into the mountains quickly, seeking the lode source of the placer gold, and founded mining camps at Black Hawk and Central City. A rival group of civic individuals, including William A.H. Loveland, established the town of Golden at the base of the mountains west of Denver, with the intention of supplying the increasing tide of miners with necessary goods. The movement to create a territory within the present boundaries of Colorado followed nearly immediately. Citizens of Denver and Golden pushed for territorial status of the newly settled region within a year of the founding of the towns. The movement was promoted by William Byers, publisher of the Rocky Mountain News, and by Larimer, who aspired to be the first territorial governor. In 1859, an informal movement to establish the Territory of Jefferson was launched, with entreaties sent to the United States Congress for its official organization. Congress did not wait long in granting the request of the citizens, partly encouraged by the promise of vast mineral wealth in the region. 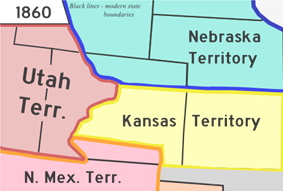 The territory was officially organized by Act of Congress on February 28, 1861, out of lands previously part of the Kansas, Nebraska, Utah, and New Mexico territories. Technically the territory was open to slavery under the Dred Scott Decision of 1857, but the question was rendered moot by the impending American Civil War and the majority pro-Union sentiment in the territory. The name "Colorado" was chosen for the territory. It had been previously suggested in 1850 by Senator Henry S. Foote as a name for a state to have been created out of present-day California south of 35° 45'. To the dismay of Denverites, the town of Golden became the territorial capital, a situation that was rectified to the advantage of Denver as it grew at the expense of Golden. During the Civil War, the tide of new miners into the territory slowed to a trickle, and many left for the East to fight. The Missourians who stayed formed two volunteer regiments, as well as home guard. Although seemingly stationed at the periphery of the war theaters, the Colorado regiments found themselves in a crucial position in 1862 after the Confederate invasion of the New Mexico Territory by General Henry Sibley and a force of Texans. Sibley's New Mexico campaign was intended as a prelude to an invasion of the Colorado Territory northward to Fort Laramie, cutting the supply lines between California and the rest of the Union. The Coloradans, led by General Edward Canby and John M. Chivington, defeated Sibley's force at the Battle of Glorieta Pass, thwarting the Confederate strategy. In 1851, by the Treaty of Fort Laramie, the United States promised the Cheyenne and Arapaho tribes control, in the Colorado area, of the Eastern Plains between North Platte River and Arkansas River eastward from the Rocky Mountains. The Fort Laramie Treaty, in Article 4 of the treaty, did allow U.S. citizens to lawfully reside in or pass through the newly created Indian territories. Since this treaty was enacted before the railroads had come and before the finding of gold in the region, few whites had ventured to settle in what is now Colorado. By the 1860s, as a result of the Colorado Gold Rush and homesteaders encroaching westward into Indian terrain, relations between U.S. Americans and the Native American people deteriorated. On February 18, 1861, in the Treaty of Fort Wise, several chiefs of Cheyenne and Arapaho agreed with U.S. representatives to cede most of the lands, ten years earlier designated to their tribes, for white settlement, keeping only a fragment of the original reserve, located between Arkansas River and Sand Creek. This new fragment was assigned in severalty to the individual members of the respective tribes with each member receiving 40 acres (160,000 m2) of land. The United States, by the Fort Wise Treaty, wished to have the Indians settle the new reservation as farmers. The U.S. agreed to pay the tribes a combined total of $30,000 per year for 15 years and in addition to provide a lumber mill, one or more mechanic shops, dwelling houses for an interpreter, and a miller engineer. See Article 5 of the Fort Wise Treaty. Nevertheless, justice was never served on those responsible for the massacre; and nonetheless, the continuation of this Colorado War led to expulsion of the last Arapaho, Cheyenne, Kiowa and Comanche out of Colorado Territory into Oklahoma. Following the end of the American Civil War, a movement was made for statehood, and the United State Congress passed the Admission Act for the territory in late 1865, but it was vetoed by President Andrew Johnson. For the next eleven years, the movement for territorial admission was stalled, with several close calls. President Grant advocated statehood for the territory in 1870, but Congress did not act. In the meantime, the territory found itself threatened by lack of railroads. By the late 1860s, many in Denver had sold their businesses and moved northward to the Dakota Territory communities of Laramie and Cheyenne, which had sprung up along the transcontinental railroad. Faced with the possible dwindling of the town and its eclipse by the new towns to the north, Denverites pooled their capital and built the Denver Pacific Railroad northward to Cheyenne to bring the rail network to Denver. The Kansas Pacific Railway was completed to Denver two months later. The move cemented the role of Denver as the future regional metropolis. The territory was finally admitted to the Union in 1876. For much if not all of its existence the Colorado Territorial government did not actually own its houses of government, instead renting available buildings for governmental purposes. Today two buildings which served the Territorial government remain: the historic log building in Colorado City, and the Loveland Block in downtown Golden (housing the complete legislature, Territorial Library and possibly Supreme Court from 1866–67 with library remaining to 1868). Others which served include the original Loveland Building (1859–1933, 1107 Washington Avenue in Golden, housing the Territorial House from 1862–66); the Overland Hotel (1859–1910, 1117 Washington Avenue in Golden, housing the Territorial Council from 1862–66); and the Territorial Executive Building (unknown dates, approximately 14th and Arapahoe Streets in Golden, housing the executive branch of the government from 1866–67). J. W. Hawes (1879). "Colorado, a territory of the United States".